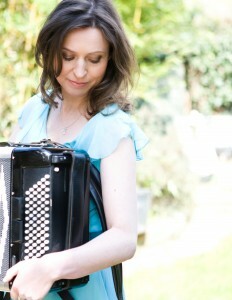 Colette O’Leary, London based accordionist, performs around the UK, Ireland and worldwide. Originally from Ireland, her varied repertoire includes Celtic, Irish, Scottish, French, Italian, Eastern European, Russian and South American. Colette was born in the highly musical area of Sliabh Luachra in Co. Kerry, southwest of Ireland and raised in Dublin. At the age of five, she took her first piano accordion lesson. At age 11, Seamas Meehan of music branch Comhaltas Cluain Tarbh Dublin, became her teacher. It was Seamas who first harvested her inspiration and passion for Irish music. By the age of eighteen, Colette had won two All-Ireland titles. Colette was a founder member of highly acclaimed all girl Irish group “Bumblebees”. Between 1996-2002, they released two albums Bumblebees and Buzzin’, the latter produced by Trevor Hutchinson (Waterboys, Sharon Shannon band, Lunasa). Their infectious brew of tunes from Ireland, Canada, Cape-Breton, France and Italy won them many accolades. They were festival favourites at Celtic Connections Festival Glasgow and toured worldwide in US, Europe and UK. Buzzin’ was voted one of the top 10 albums by The Echo Newspaper, New York City. Colette moved to London in 2001. Inspired by the great feast of world genres on her doorstep, she recorded her first solo album The Attic Room with guitarist Ed Boyd, bodhran player John Joe Kelly (Flook, Mike McGoldrick band) and jazz maestro Roger Beaujolais on vibraphone. Since 2007, Colette has been recording and touring worldwide with the fabulous “The Long Notes”. They have released two albums The Long Notes and In the Shadow of Stromboli and recently played to packed houses at London’s Kings Place, The Roundhouse and The Underworld, Camden. Colette’s career highlights include performing for Irish President Mary McAleese and the Latvian President at Dublin Castle, for Princess Anne at the Guildhall and at Kensington Palace. Colette was one of 14 handpicked instrumentalists and singers chosen to participate in Liverpool Philharmonic Hall’s first “Irish Sea Sessions” which also featured Dublin’s luminary singer songwriter Damien Dempsey. Festival appearances include Glastonbury, Celtic Colours Canada, Celtic Connections Glasgow, HebCelt, Wickham, Milwaukee USA, Lorient Interceltique Brittany, Orkney, Copenhagen, Tonder Denmark, Highlands and Islands, Lovebox, Tate Modern, Wychwood, Return to Camden, From the Heart Barbican, Wimborne, Blas, Moseley, Devizes, Towersey and Trowbridge Festivals. Over the years, Colette has shared festival billings with Jools Holland, The Chieftains, Maire Ni Bhraonain (Clannad), The Proclaimers, Luka Bloom, Brian Kennedy, Paul Brady, Mary Coughlan and many more. Colette has featured on numerous TV programmes, BBC Alba’s “Horo Geallaidh”, UTV’s “Kelly Show”, RTE’s “The Late Late Show”, “Mary Kennedy Show” and “The High Reel”, TG4’s “Ionad Cois Locha” and “Sult”, the latter a collaborative project with Donal Lunny (Bothy Band, Moving Hearts). Her albums have aired on RTE Radio, BBC Radio 2, BBC Radio 3, Lyric FM, as well as countless regional BBC and radio stations throughout the USA. She is also in demand as a studio musician having recorded on albums with Wolfstone, Maire Breatnach, Mark Nevin (Fairground Attraction) and Russian legend Boris Grebenshikov.